Met up with a fellow Valk rider and VRCC member here in PA. He's a local so I tagged along as he made his annual trip up to Foxburg Winery beside the beautiful Alleghany River here in PA. He said it'd be a good group of riders, fun roads--mostly 2 lane, and a good lunch. He was right on all counts. Invariably sitting around the lunch table with a group of mostly non-Valkers, someone asked, "So, are you both running car tires on those Valks?" yup. We were. "How do they handle?" Well, they were behind us in the curves and didn't blow past us, so the darksides must have handled fairly well. 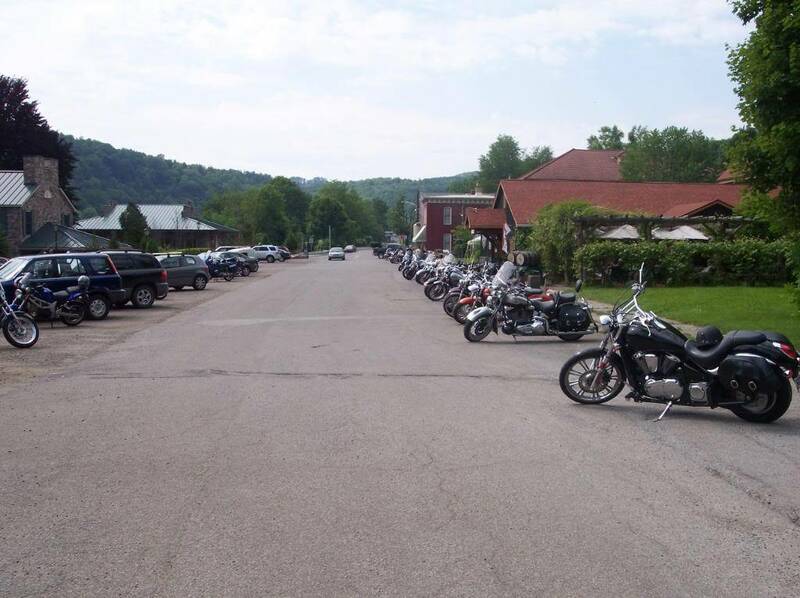 Foxburg is very biker friendly, when we pulled up to the winery/resturant we weren't the only bikes there at all. BTW, out of five bikes, I was the only non-black bike there! Go figure.